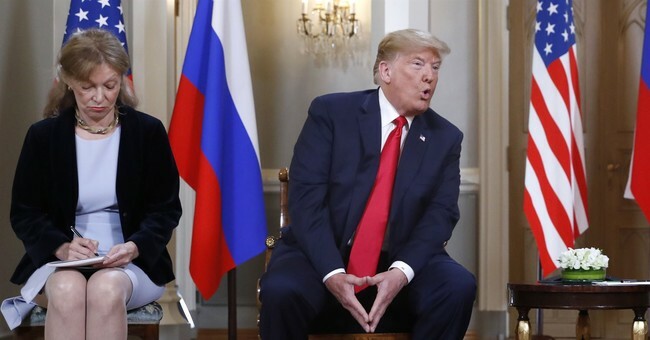 Democrats in Congress demanded this week that Marina Gross, the translator in the room with President Trump and President Vladimir Putin in Helsinki, Finland on Monday, come to Washington and tell them what was discussed in the closed-door meeting. Republicans, even anti-Trump ones, are resisting the effort. When House Intelligence Democrats brought the subpoena to a vote, every Republican on the committee voted against it. Sen. Lindsey Graham (R-SC) explained why subpoenaing the interpreter could set a dangerous precedent. It could be the "last time" the U.S. president ever meet privately with a foreign leader. "Absolutely not," Lindsey Graham said when asked if he'd support having Marina Gross, the American translator in Trump's meeting with Putin, testify before Congress. Sen. Bob Corker (R-TN), one of Trump's most vocal Republican critics, had to agree. "I know in this particular case, the person was a direct employee, but if we are going to start getting translator's notes, I think we are moving to a precedent that - unless some crime has been committed - is unprecedented and just not appropriate." A group of former President Obama and President George W. Bush officials are also under the impression Gross does not need to be grilled on Capitol Hill. “For the same reasons why we need to protect our own diplomats, there is a real concern about having translators be subject to subpoenas,” said David Mortlock, Obama's director of international economic affairs at the White House National Security Council. One Republican, however, is siding with the Democrats in their call for Gross to at least turn over her notes. Sen. Jeff Flake (R-AZ) argued in a Senate floor speech that Trump's rendezvous with the enemy demands that Congress see what was discussed. “I would hope that those notes — all interpreters take notes — would be turned over,” he said. “We need to know." President Trump angered both Republicans and Democrats on Monday by seemingly taking Russia's side over the U.S. intelligence community when asked if Russia had meddled in our elections.